DENVER – After years of watching sales of elk licenses slide, Colorado wildlife officials are launching a nationwide ad campaign to bring more hunters to the state. The trick will be convincing people who pay hundreds of dollars for a nonresident hunting license in some states that the 23 million acres of public land and 300,000 elk in Colorado are the best in the West. The Colorado Division of Wildlife gets about two-thirds of its $110 million budget from hunting and fishing licenses, but sales of elk licenses in Colorado dropped by more than 37,000 from 2005 to 2009, with revenue falling by roughly $8 million in that time, Director Tom Remington said. About 229,000 limited draw and over-the-counter licenses were sold in 2009, with thousands left unsold. The division largely doesn’t get money from the state’s general fund, drawing instead from lottery funds, federal excise tax revenue and mostly, licenses. “It’s critically important for us to attract elk hunters. It’s our very survival,” division spokesman Randy Hampton said. This week, the division is launching its “Elevate Your Game” marketing campaign with a new website – huntcolorado.org – that went live Monday. It’s also running ads in the March issues of Outdoor Life magazine and Game and Fish magazine, on websites geared toward outdoorsmen, and on The Sportsman Channel and the Outdoor Channel to draw elk hunters. The budget for ads and production is roughly $300,000 for an effort that runs through April 5, the deadline to apply for big-game limited licenses for specific areas and dates. The division has added nine temporary employees and two volunteers to answer phone calls and questions. 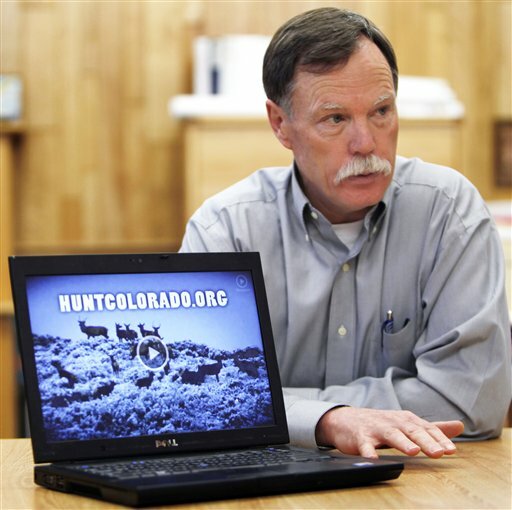 Hunting brochures have been redesigned, and the division has online educational videos on elk hunting in Colorado. Division of Wildlife marketing specialist Debbie Lininger said she hopes the campaign leads to sales of 4,000 more licenses this year. It’s part of a larger campaign to recruit and retain hunters and anglers. The short-term goal is to “stop the bleeding” in economic losses for the Division of Wildlife and boost communities that rely on hunting, Remington said. The division says hunting and fishing support 20,614 jobs statewide and that wildlife-based recreation ranks with skiing for driving Colorado tourism. The marketing program also will help control growth in Colorado’s elk herds. “If we continue to lose hunters, the ability to manage our elk populations will be severely compromised,” Remington said. Remington said the long-term goal is getting more kids and families outside, whatever the activity. Getting people invested in the outdoors will help the agency politically and economically down the road, he said. Colorado may have luck luring more out-of-state hunters this year after a big hike in license fees for nonresidents in Montana. Also, Colorado doesn’t have wolves. The Colorado success rate for hunters harvesting elk was 23 percent in 2009. Wyoming typically averages a rate of 40 percent, Langston said. Other states looking to draw hunters have had initiatives to encourage beginners, but the Colorado campaign may be the first comprehensive, nationwide marketing effort by a state agency, Lininger said. Bob Wharff, executive director of Wyoming Sportsmen for Fish and Wildlife, said most elk hunters who splurge on out-of-state trips will focus on what they can take home when they decide where to go. That means states known for trophy elk may have the edge. “That’s a bigger factor than most states realize,” Wharff said.